Thread: Bang Saen Songkran Festival. On Thursday Morning we travelled to Bang Sean Beach which is located 40kms outside of Pattaya in the direction of Bangkok to witness a Sand Castle Competition with a difference. As part of their local Songkran Festivities, every year the competition is held on the Beach and teams compete against each other to produce the most spectacular sand castle. From what we saw, the sand castles were extremely impressive and teams used techniques such as baking the sand to ensure their castle did not fall. 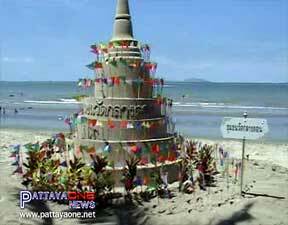 This is part of the Bang Saen Songran Festivities being held on the beach which culminates on Friday. With no shortage of sand to build sand-stupas, the stupa building contest is a predominant element of the Songkran festivities in Chon Buri. Residents of the each of the villages in the district gather together to take part in community Buddhist merit-making. Monks are invited to conduct merit-making ceremonies and rituals, whilst local residents present merit-making offerings and sprinkle scented lustral water on Buddha images in a Songkran Thai New Year bathing ritual. Families pay respect to elderly relatives and other respected individuals by pouring scented lustral water over the hands. Festival highlights include the 'Kong Kao' religious ritual, rarely seen folk games and traditional Thai sports. Songkran beauty pageant and Siracha Songkran Parade.